Here's a photo from the AmeriqueFrancaise.org site showcasing some traders with their large bark canoes and slender paddles. 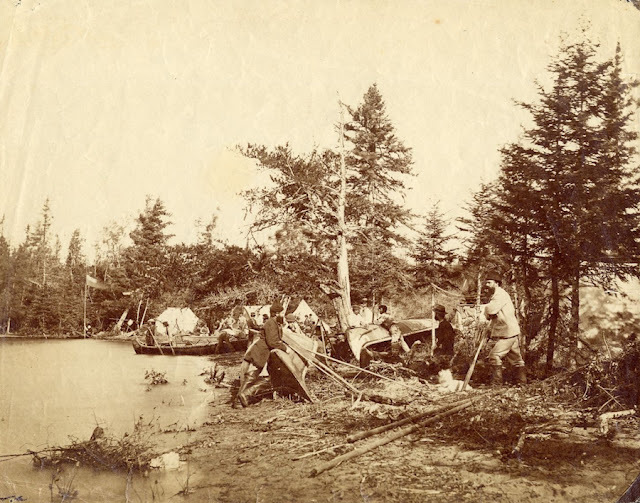 The photo is dated to circa 1900 and was taken near present day Thunder Bay, Ontario. The French caption translates to "Canadian Pacific Coast Explorers' Camp on the edge of Kaministiquia"
In the background, there are two paddlers standing at the bow of the trade canoe stabilizing the craft with their paddles. The slender blade designs are clearly evident in the posed photo. Another crewman, possibly someone of importance to the expedition, is standing at the far right. He poses closer to the camera and reveals a close up of the ridged, narrow paddle design. The blade looks to have some sort of painted decoration. "Cie du Pacifique Canadien sur le bord de la Kaministiquia" translates to Canadian Pacific Company on the banks of the Kaministiquia. So think CP Rail surveyors on the banks of the Kaministiquia River near present day Thunder Bay.